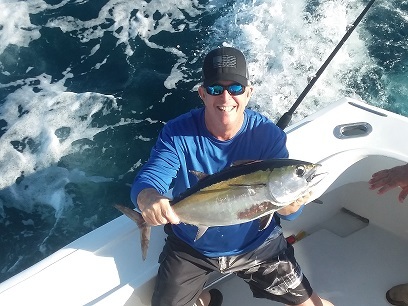 Andrew, David, Jose, Neil, Erin and Kevin chartered the Top Shot Sportfishing charter boat team to do some deep-sea charter boat sport fishing in Fort Lauderdale, FL. The guys were celebrating Jose's bachelor party while fishing with our team. We started the morning catching live bait at the sea buoy in Fort Lauderdale. With a chum bag and light spinning tackle, the guys caught a dozen Blue Runners. After catching bait, we cleared the lines and started trolling in 100 feet of water north of Fort Lauderdale, 1.8 miles from shore. If you venture off another quarter of a mile, you would find yourself in 500 ft. of water due to our extreme drop off. We used two deep planner lines and 3 surface lines. The first Kingfish was caught on one of the deep planner lines with a double hooked Bonito strip with a sea witch in front. Our mate, Troy, put the Kingfish in the fish box. There was a school of Kingfish in this area, so we concentrated on making turns over the school from offshore to inshore which was the best direction. We caught 5 Kingfish keepers and let 3 undersized Kingfish go. Next, we decided to kite fish – we put two kites out with two live Blue Runners for baits per kite and set up in 185 ft. of water. We also put a Shark bait down on the bottom. After a good try for Sailfish and Shark and no shots, we decided to go back to trolling. As soon as we got the baits in the water, we started catching Black Fin Tunas and caught a total of six of them. After a good day fishing it was time to come home. The anglers retired into the a/c salon and enjoyed the relaxing trip back to the dock at Bahia Bar Yachting Center, 801 Seabreeze Blvd. Fort Lauderdale 33316. Troy filet the catches so that the anglers can enjoy them for dinner that night.